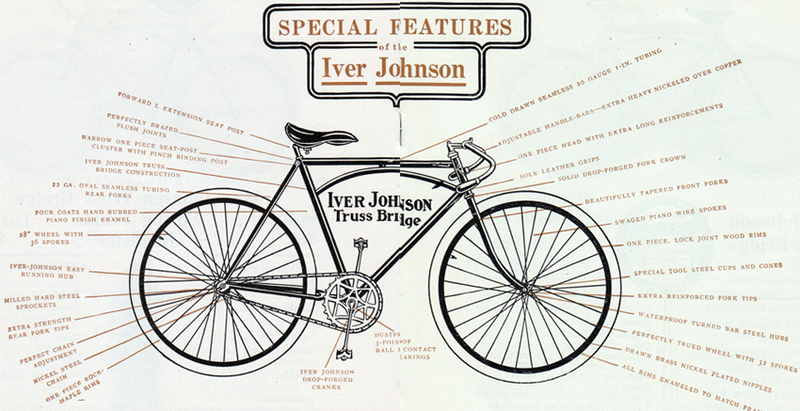 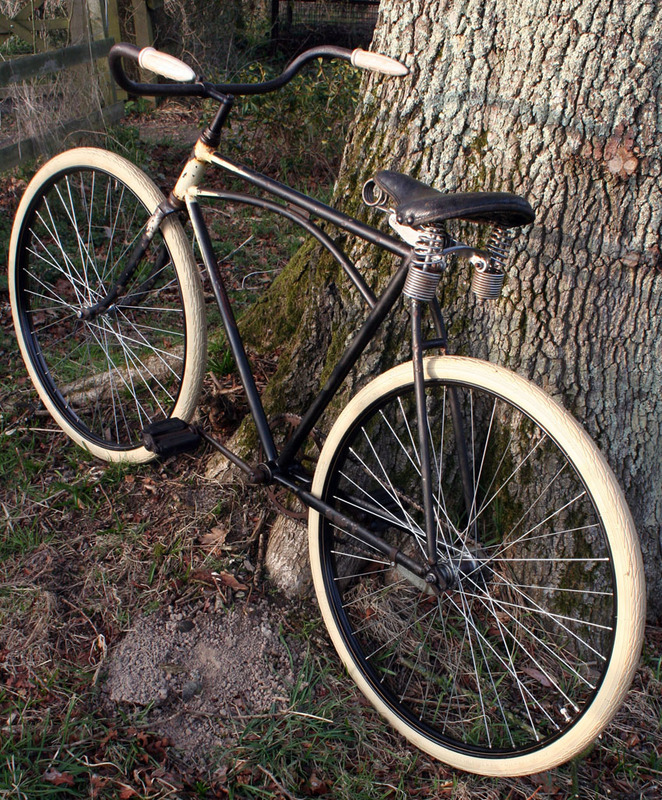 Iver Johnson registered the patent on the truss-bridge design, and this model was their best selling bicycle. 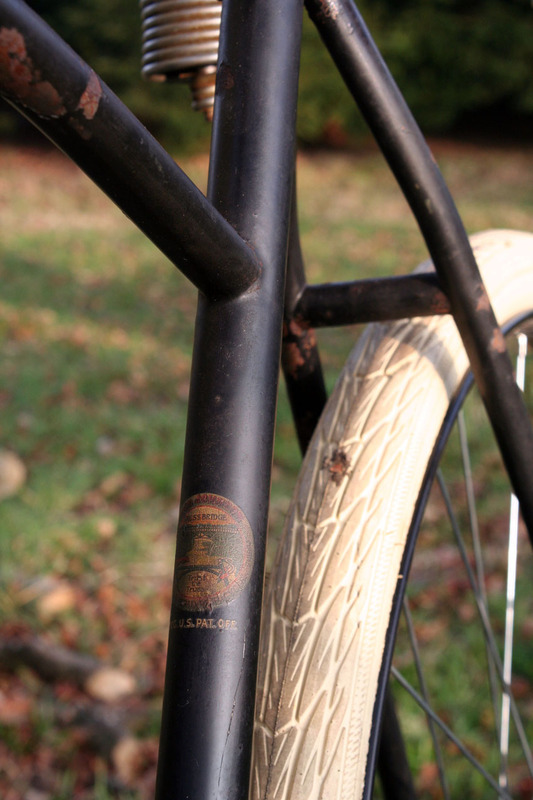 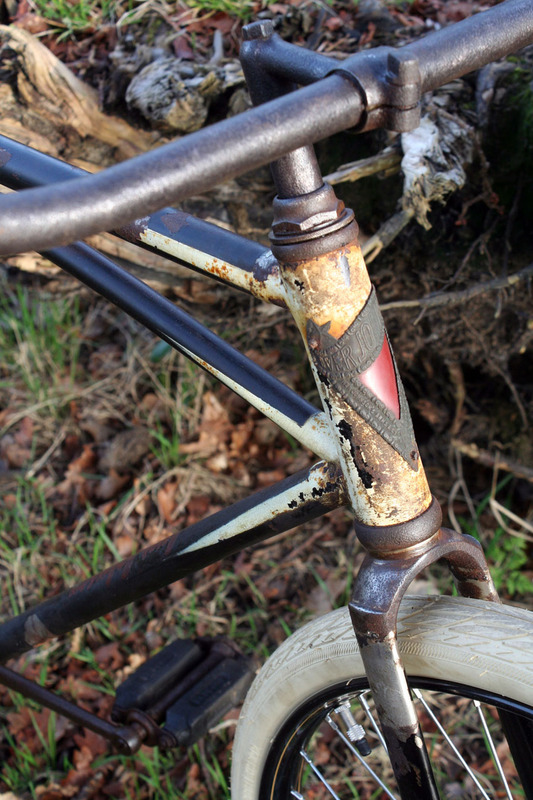 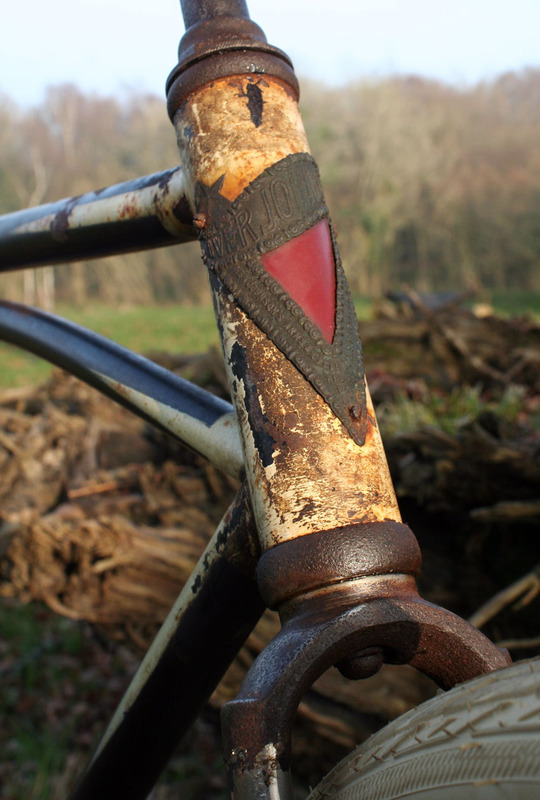 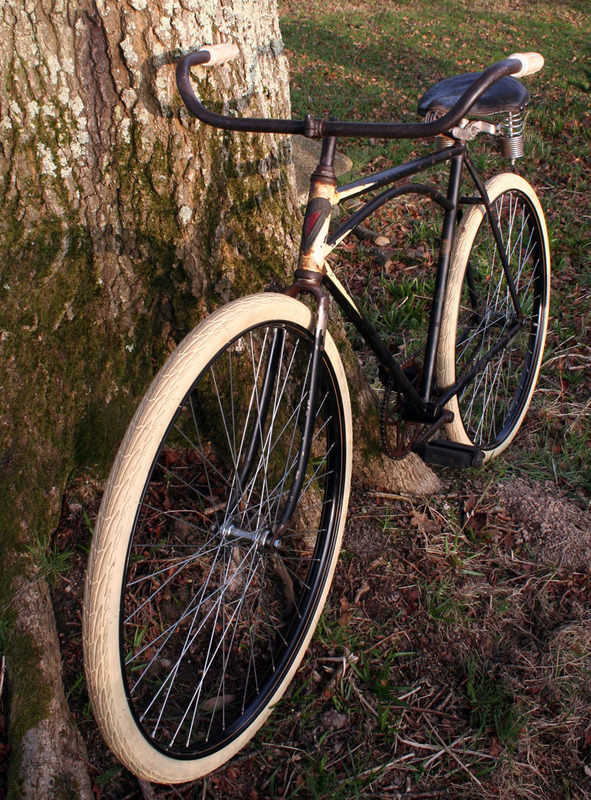 As you can see from the photos, the paintwork on this Iver Johnson is remarkably well-preserved for a 100-year-old bicycle. 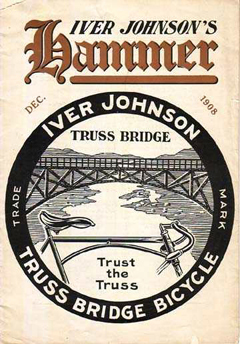 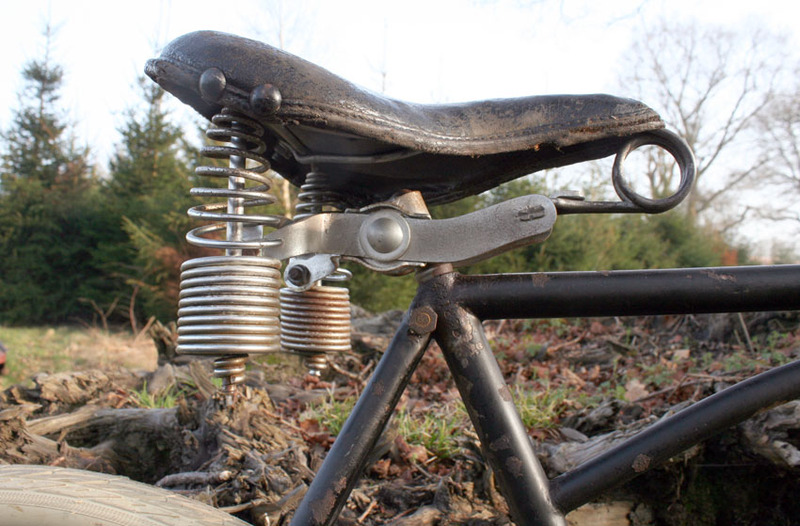 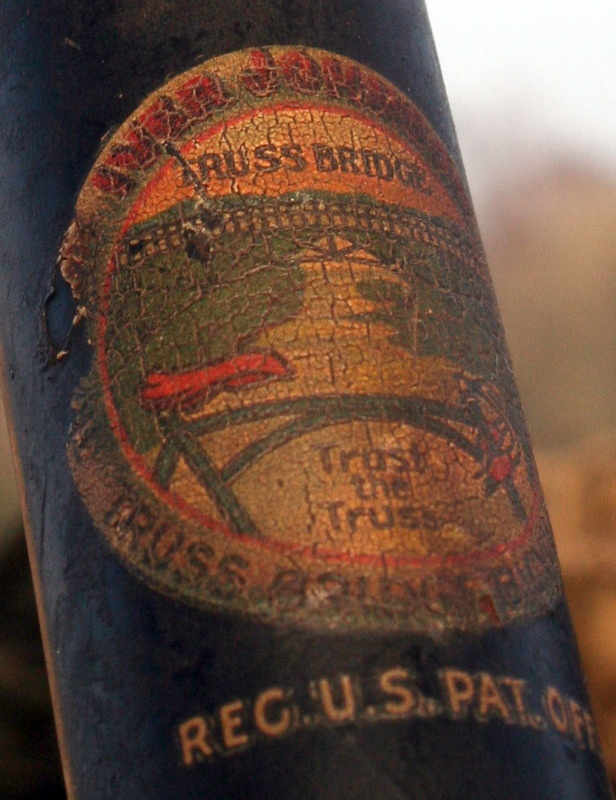 As well as the ‘Iver Johnson’ name emblazened on the down tube (the photo above), there’s a fabulous transfer on the seat tube which proudly declares the company’s motto TRUST THE TRUSS. 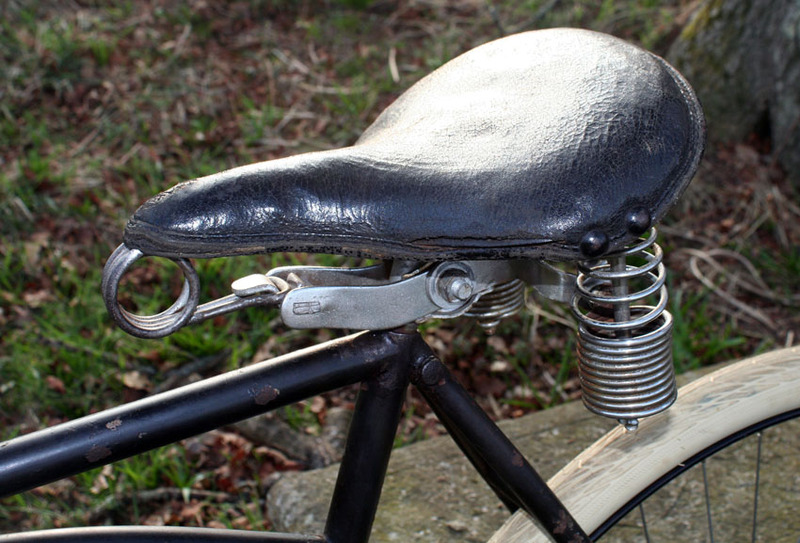 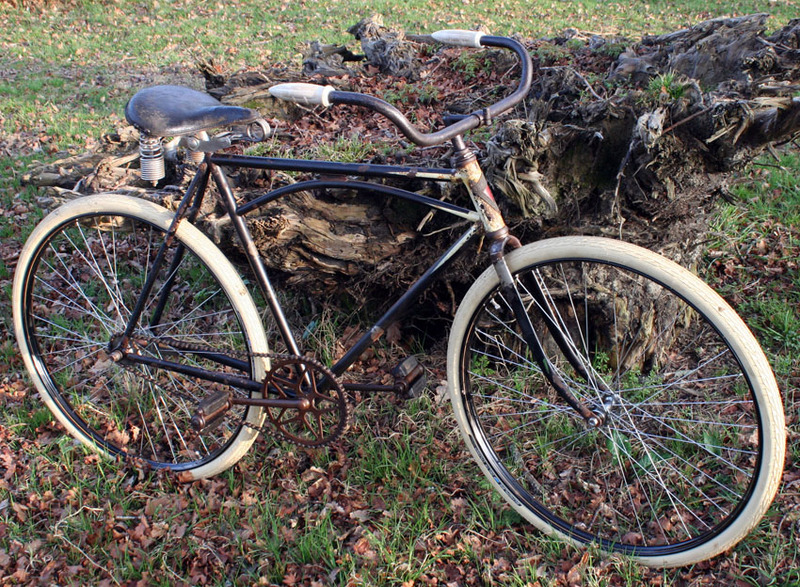 Like all American bicycles of the era, this would have originally had wooden wheels and single-tube tyres. 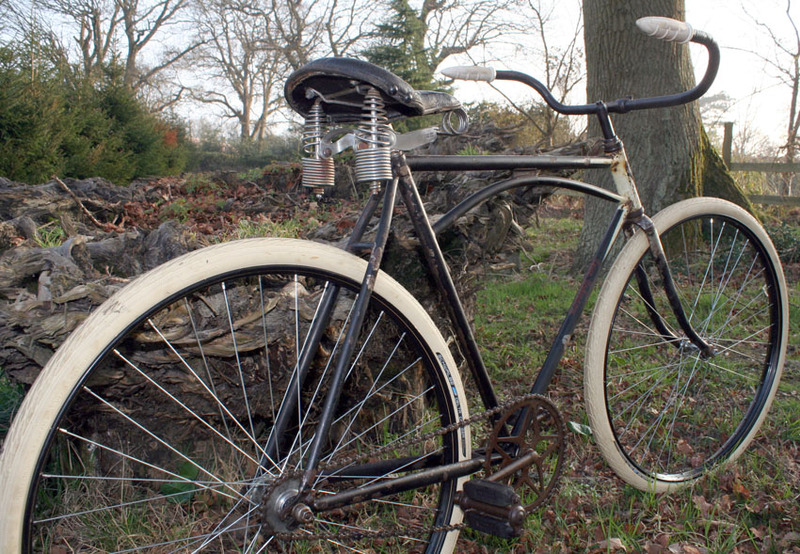 The American cycle industry failed in the early years of the twentieth century for precisely this reason. 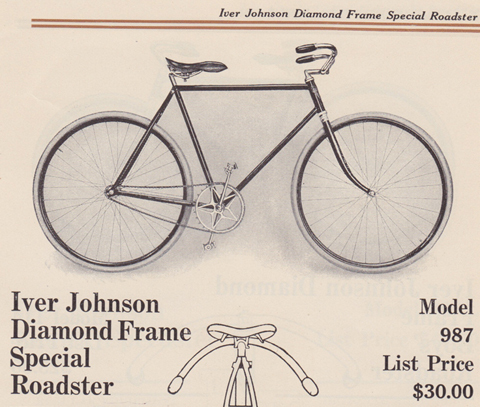 With ever-increasing competition and prices of new bicycles going down year by year, the manufacturers made little money selling bicycles. 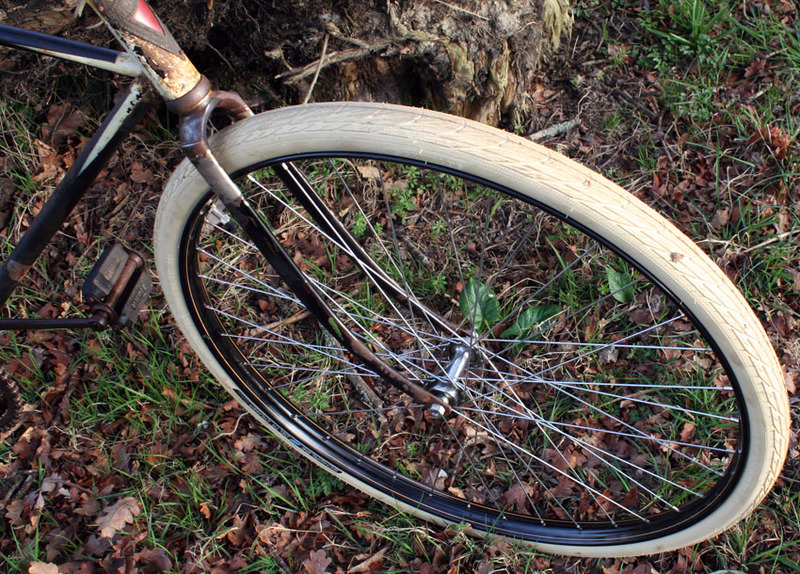 So they made their money from the expensive wooden wheels and single tube tyres that could not be repaired. 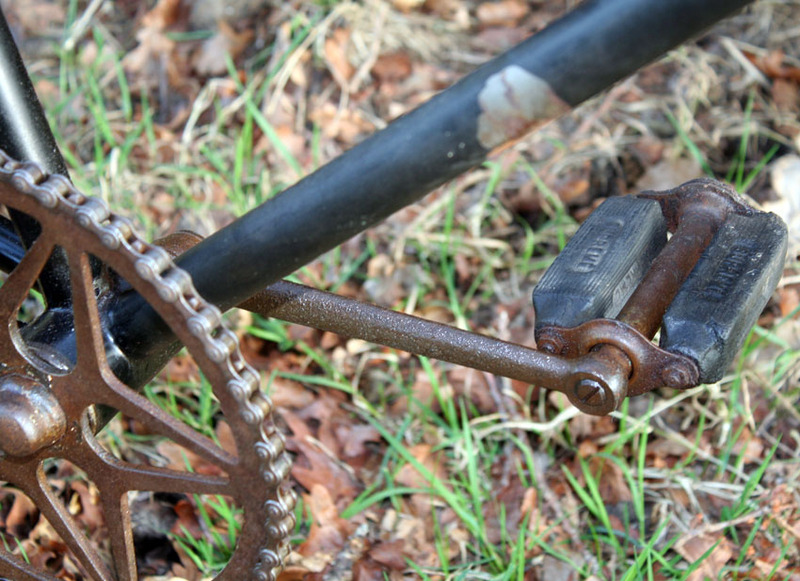 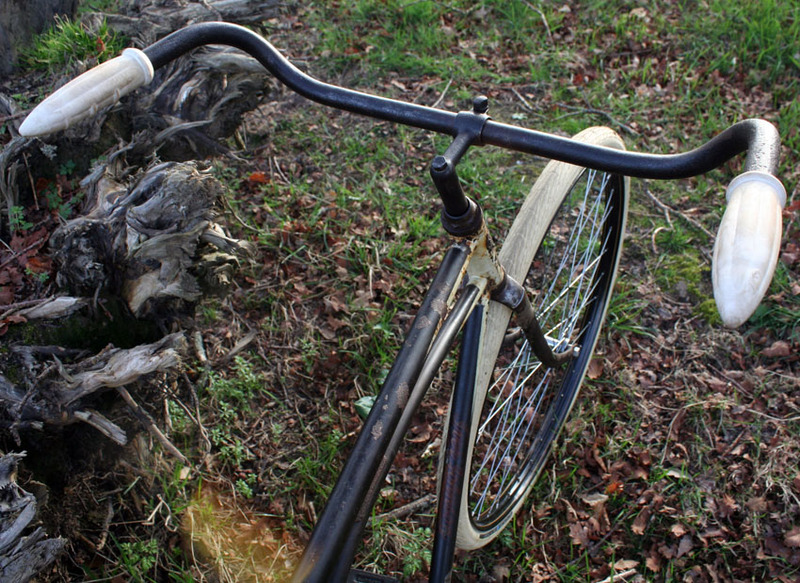 It meant that it was not economical for customers to repair bicycles once a new tyre or wheel was required. 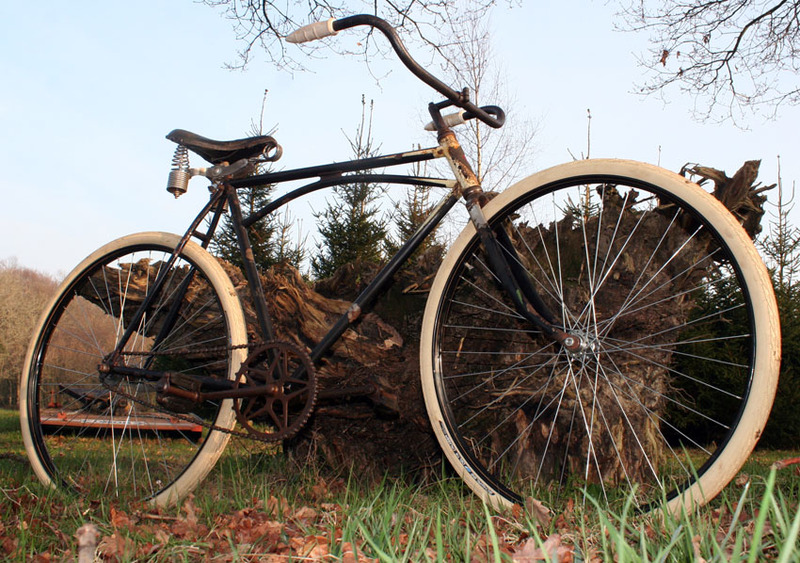 No other country of the world would import American bicycles for this reason, and the American government levied very high tariffs on bicycles imported from Europe so that American people did not have the choice of cheap metal wheels and cheap replaceable pneumatic tyres. 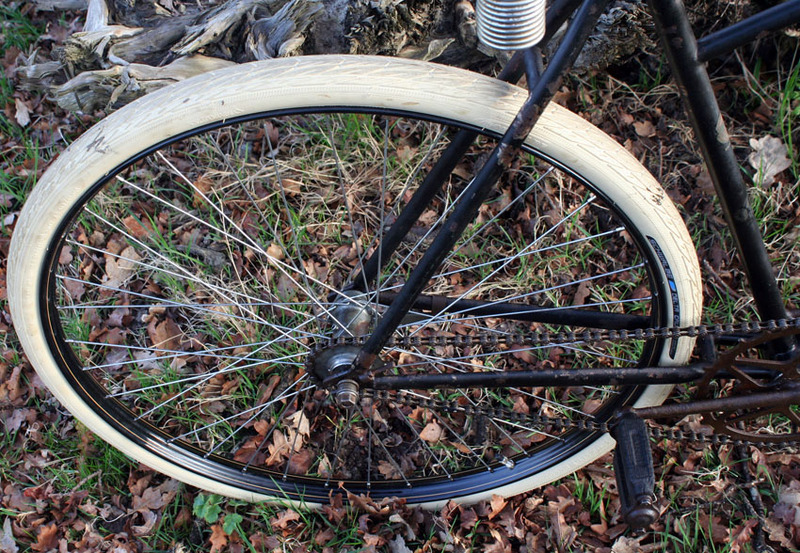 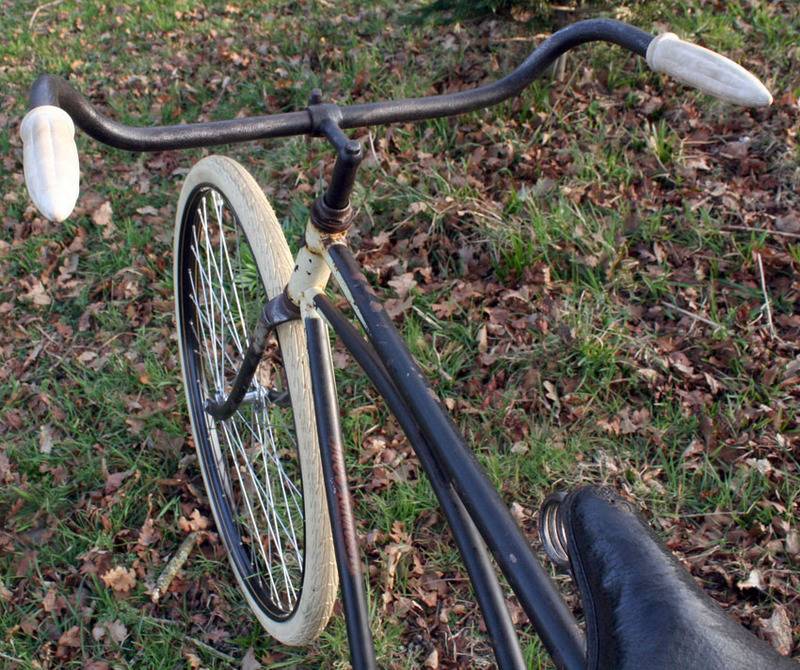 One hundred years down the road, the problem obviously still exists: a bicycle with wooden wheels and single tube tyres is a ‘display bike.’ American vintage cycle enthusiasts who wish to use their bikes usually replace the wheels with new Italian wheels that use 27″ tyres. 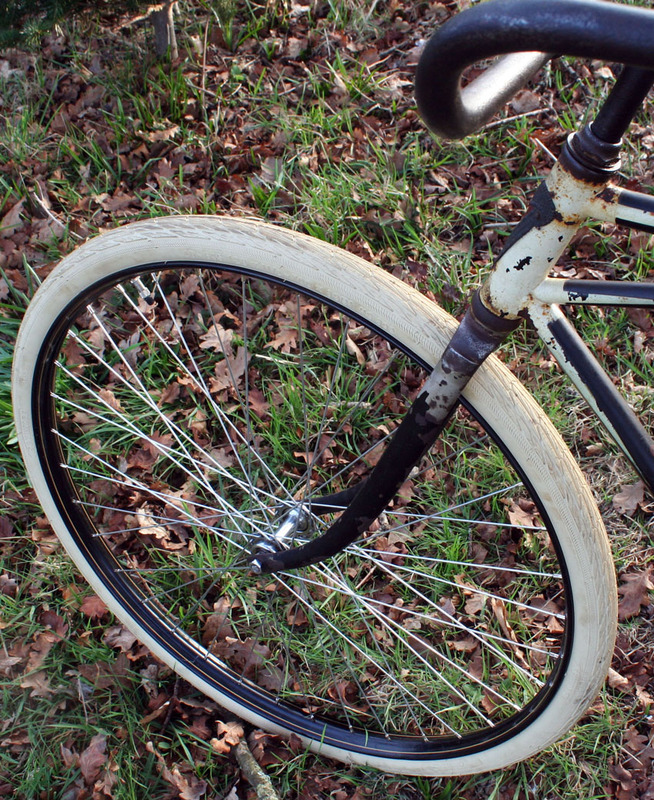 I rebuild the wheels by putting old coaster hubs into 28″ westwood rims so that I can fit the attractive (and well-made) 28″ cream Schwalbe tyres you see here. 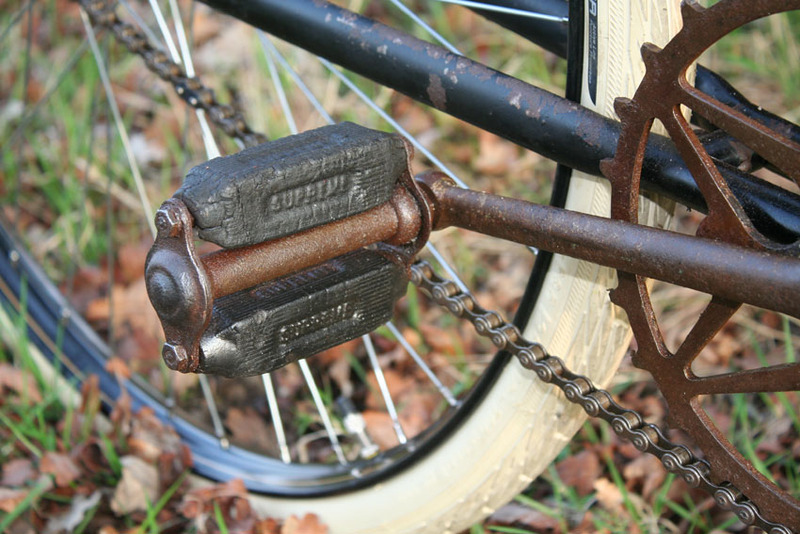 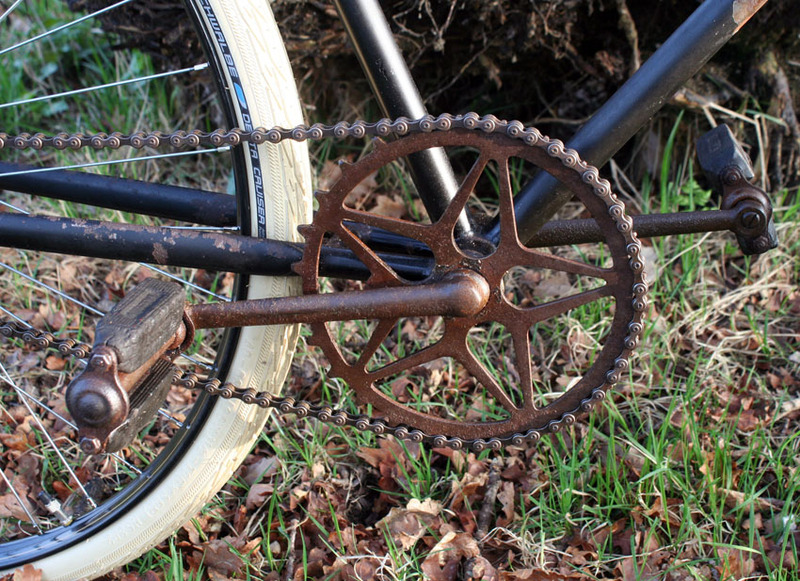 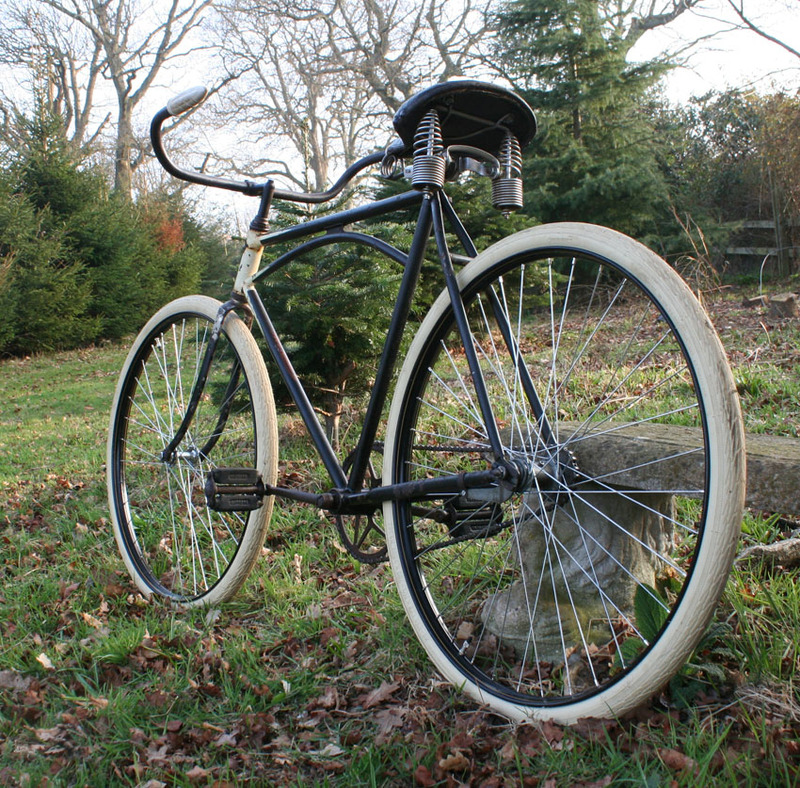 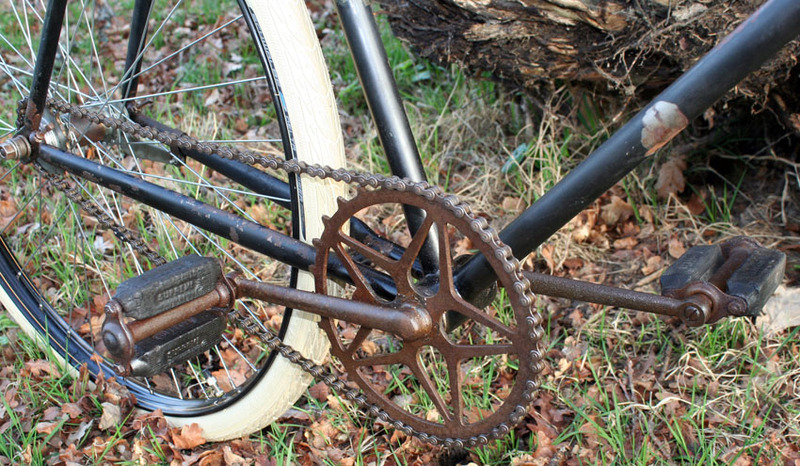 So this bicycle is the best of both worlds – a fabulous hundred-year-old bicycle with the unique truss-bridge design,cosmetically original and unrestored; but mechanically restored with practical wheels and tyres. 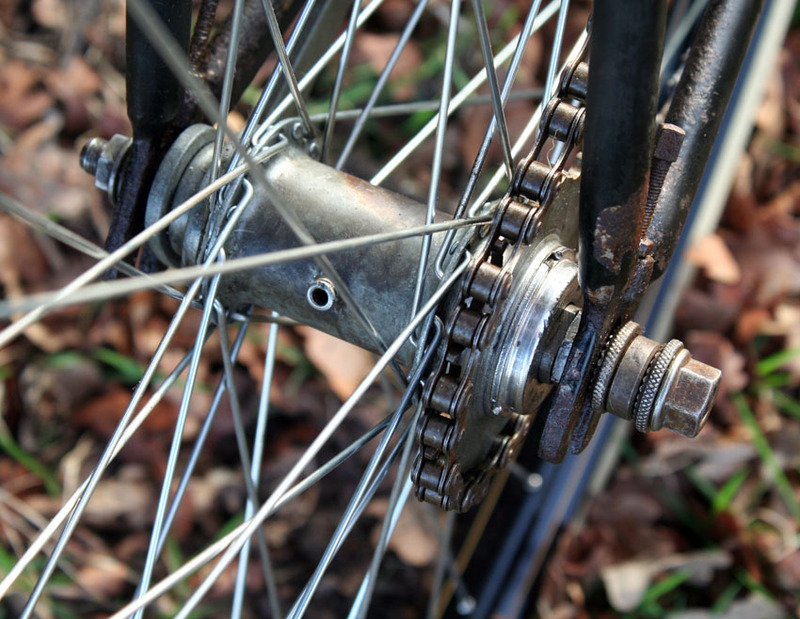 Above and below, you can see the two most common chainweel sprockets used by Iver Johnson. 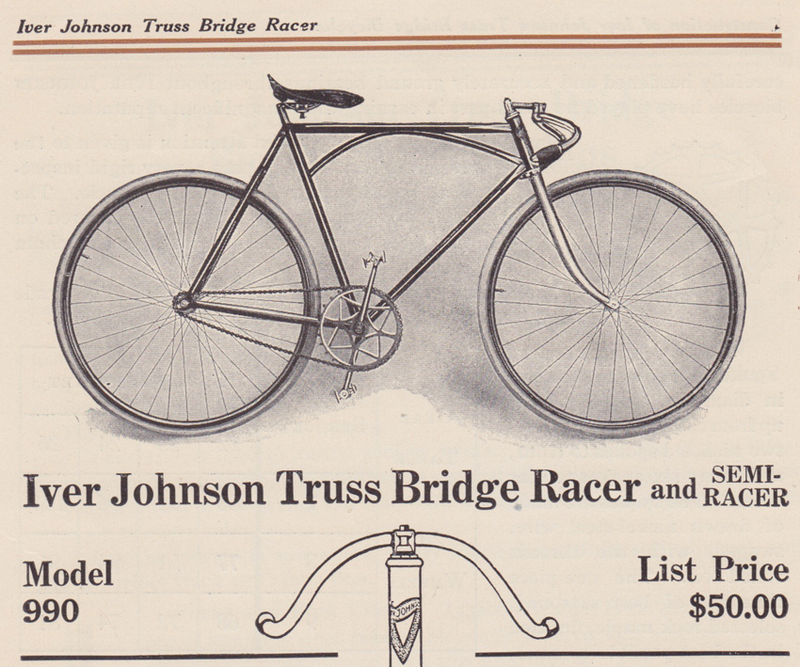 This catalogue is from 1909. 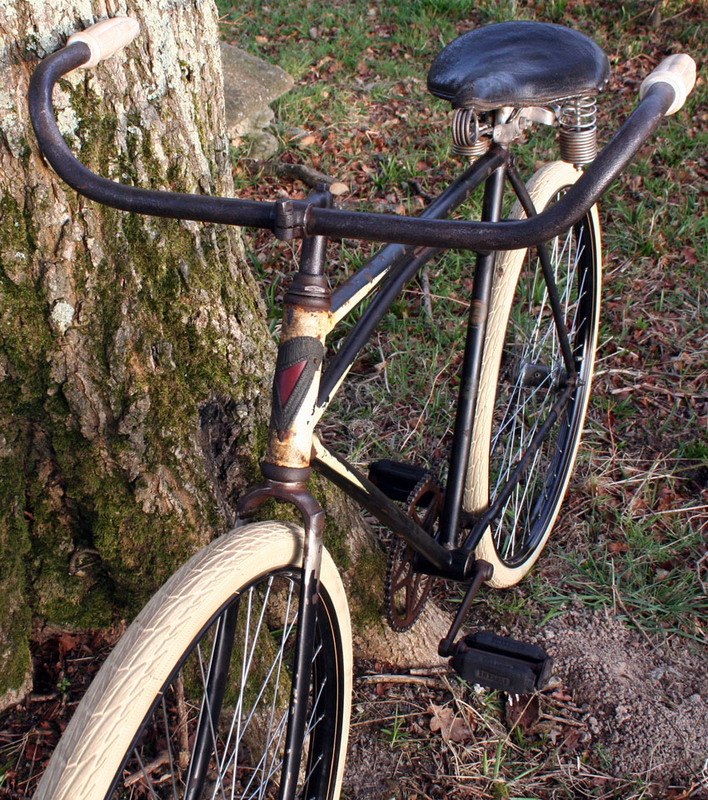 The handlebars can be turned up or down as you wish. 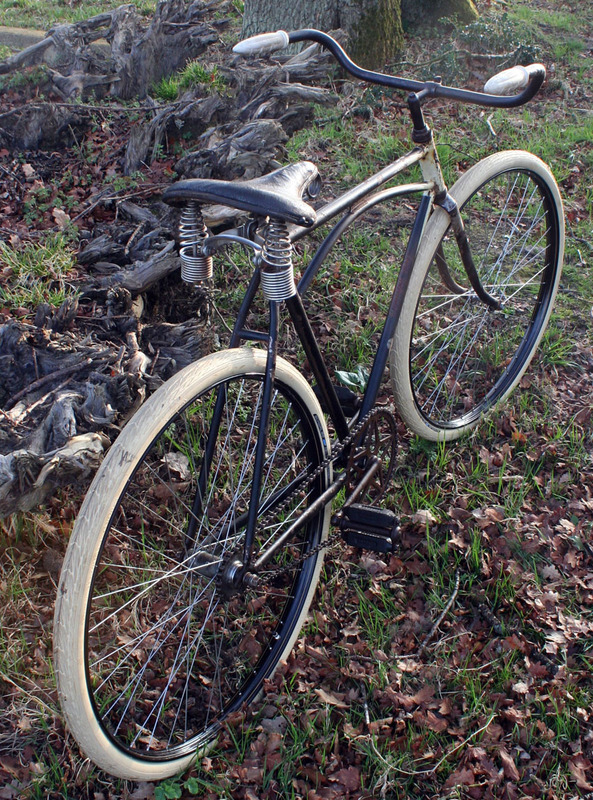 I prefer them up, to ride as a roadster, but you can turn them down to give it the style of a racer.